Fig. 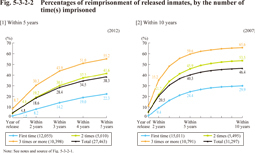 5-3-2-1 shows the percentages of cumulated number of reimprisoned inmates within the period of five and 10 years after the release from prison in 2007 and 2012 among the released inmates of a given year (hereinafter “percentages of reimprisonment”), by reasons for the previous release (either released on completion of the term or released on parole). Fig. 5-3-2-2 shows the percentages of reimprisonment of inmates released in  2012 and  2007, by the number of time(s) they had been imprisoned at the point of previous imprisonment. Fig. 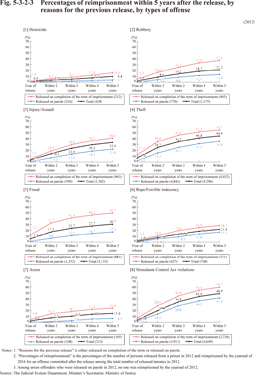 5-3-2-3 shows the percentages of reimprisonment of released inmates, by types of offense. Fig. 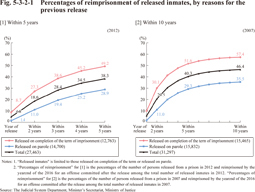 5-3-2-4 shows the trend of percentages of reimprisonment within the period of  two years and  five years after the release, by reasons for the previous release. Fig. 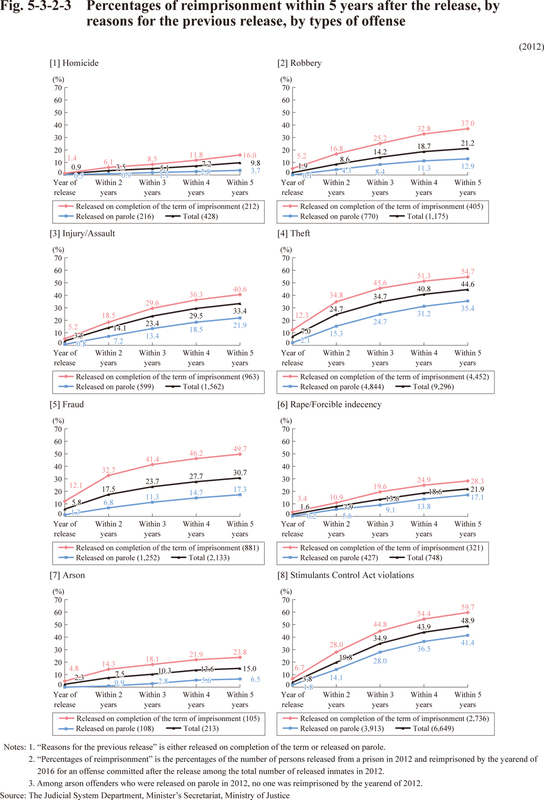 5-3-2-5 shows the trend of percentages of reimprisonment within the period of two years after the release,  by males/females,  by age groups, and  by types of offense.